Brian Clesham has led several chemical, biological, radiological and nuclear (CBRN) international and inter-agency projects. He also chaired CBRNE Conferences for the Asia Pacific region in Singapore in 2011 and again in 2012. Previous CBRN appointments have included 4 years as the British Army’s dedicated CBRN principal and 3½ years as Chief of Staff at the United Kingdom’s Defence CBRN Centre. Brian is currently The CBRN Consultant with Cristanini Decontamination Systems. Q: While there are treaties and bans against the aggressive use of chemical and biological weapons, the truth is warfighters can be, and are, exposed to chemical, biological, radiological and nuclear (CBRN) hazards. Just what are the many possible sources of exposure in combat or rescue operations, and how prevalent is the need for in-the-field detoxification gear? A: That is a very good question because the conventions are really targeting weapons, but one look at the Emergency Response Guidebook and you will find more than 8,000 lethal or injurious toxic industrial materials that can be subject to multiple forms of release; for example, through collateral damage, improvised use, criminality, accident, natural disaster or neglect. All these situations can confront the warfighter in the type of complex operations that we are undertaking now and will undertake in the future. Q: Right. I don’t think the general public really has any idea how these toxins are really all around us. Thankfully during day-to-day normal operations they are well under control, but that all changes in a warzone. A: Toxic materials are passing through ports, airports, on road and rail systems, stored or subject to continual use for the purpose for which they are intended, mainly in and around cities, towns, industrial areas, the energy and maritime sector, and in the agricultural domain. And then there is the additional biological risk of endemic and mutating disease and the conundrum of whether release is naturally occurring or deliberate. One of the concerns is the proliferation of Unmanned Aerial Systems and the potential use of that kind of platform in the hands of an adversary. There is, more than ever, an enduring requirement to ensure that our people who are placed in danger are properly equipped, to not only protect themselves, but do the jobs they are deployed to do. It has always been extremely important that we are able to maintain mission profile regardless of the threat or use of chemical and biological weapons. Both individual and joint force decontamination and detoxification can be a critical part of that process. Q: And I would imagine with the rise in terrorist activity and more irregular or asymmetrical warfare, the risk of such exposure has increased in recent years? A: Yes, I would make a few points. First, you do not need a Ph.D and a white coat to develop improvised CBR devices. Terrorists, irregular organisations or criminal elements may exploit opportunities for their use. We have always faced the threat from the ‘dysfunctional’ lone wolf within our midst, empowered by the internet, a garage and a couple of hundred dollars. But today we are increasingly facing the threat of these types being actively “recruited” and shown what to do. This can be attributed in part to the Information Age, illicit websites linked to Al Qaida and its affiliate networks. 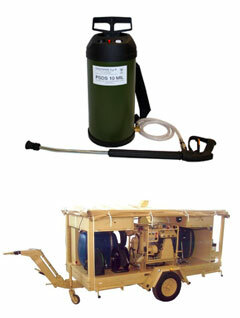 Secondly, we have one multi-functional machine with its own built-in generator that does everything; supporting decontamination of vehicles, aircraft, personnel and casualties, equipment, terrain, infrastructure; while also delivering illumination, fire-fighting, volatile and toxic de-gassing, waste management and a host of other functions as well. Having one machine brings extraordinary time, resource and through-life cost savings; to wit: one machine to train on and operate on-site, one set of documents, one safety case, one set of spare parts, one machine to maintain year after year. It keeps things simple for operators and logisticians and delivers through-life economies. With low probability but high consequence events, you don’t want to tie down huge resources. Thirdly, while the number of states possessing a formal CBRN capability is likely to diminish, there may be attempts to covertly retain or improve capability; to disguise material, weapon systems or munitions within legitimate industrial facilities. Some materials actually lend themselves to dual use i.e. legitimate holdings or precursors that can be improvised or mixed to form singular or binary weapons. Q: If you looked at the threat of toxic contamination as a spectrum, where does “detoxification” fit in, in terms of mitigating the effects of exposure and contamination? A: Well, for detoxification, we are only really looking at chemical and biological, because you cannot detoxify radiological material, hence recurring news coverage of the Fukushima disaster. Our efforts on radiological removal would concentrate on reducing the volume of radiological waste during the decontamination (removal) process. With regard to mitigation of the effects of chemical and biological hazards, this is an interesting question. In given situations, Cristanini has sought to mitigate risk by the preventive application of our universal decontaminant BX24. For example if you knew your generalist, or specialist CBRN vehicle, was imminently at risk, or had to enter a contaminated area you could apply BX24. It would serve as a detoxifying layer for a couple of hours, to break down and neutralize contaminating hazards and ease the burden of post-mission detoxification. Whatever the situation, every effort must be made to reduce the time between contamination and decontamination. Then there are fixed sites, always important and often critically so. In such circumstances there will be a compelling case for detoxification as soon as possible; just as in the Homeland Security domain there will be the need to rapidly detoxify urban areas, critical sites and personnel, from mass decontamination to the emergency services themselves to the decontamination of VVIPs, amongst other scenarios. Q: So give me a brief rundown of the types of decontamination products or equipment Cristanini currently provides to the military? A: We have a host of modular and multifunctional solutions to cater for a spectrum of operations from small to medium to large scale. These are just a small number of configurations. CBRN incidents may be small scale, in places that are difficult to access or where there are constraints on deployment or there may be a requirement to provide vehicle borne protection, with a concept similar to a fire extinguisher. Under such circumstances we would provide man-portable solutions such as our PSDS10 MIL, or for very small scale, handheld PSDS1.5 MIL, both containing the universal decontaminant BX24. Cristanini’s ‘Rapid Intervention CBRN Trailer’ offers an excellent example of medium scale multi-functionality for a great number of scenarios; ideal as a Unit Decontamination System. The same solution could be used for incidents involving warfare agents in the field or on static sites, a chemical spill, or water, fire and bio-safety within a refugee camp. At the higher end of the scale, Cristanini’s TDS 21 is a full spectrum decontamination system designed to cater for the exceptional demands of major emergencies or combat operations. 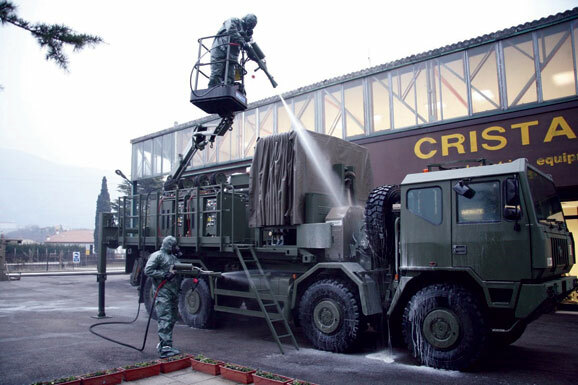 It offers the very best technology for rapid decontamination of combat vehicles, aircraft, personnel, including casualties, equipment, external infrastructure and terrain. It is a true ‘System of Systems’, delivering not only a multi-functional decontamination capability, but also the ability to neutralize chemical and biological agents with one decontaminant (eco-friendly and non-corrosive BX24) while polarizing radiological particulate. TDS 21, with its two Sanijet machines, can support four decontamination operators simultaneously and can be rapidly re-configured and deployed to meet multiple operational priorities. While the CBRN shelter is shown integrated onto an IVECO High Mobility Vehicle below, it is also within the payload for transportation by support helicopter. Q: As you see it, what are the greatest challenges in developing and deploying decontamination gear to ground troops, and how is Cristanini addressing those challenges? A: Unquestionably, it is one of keeping things simple and lightening the burden on the individual soldier, and more widely, in reducing the overall logistic burden at unit and formation level. Soldiers, Marines and Special Forces want to operate unencumbered so they can get on and do their job. Even without a CBRN environment, given the requirement for ballistic protection, things can be mighty challenging, particularly in hot climates. Add the burden of CBRN protection and you have a potentially lethal physiological cocktail. Stir in the toxic danger and psychological factors kick in as well, hence the critical importance of effective, simple training and equipment solutions. Q: Can you discuss what country’s militaries are using Cristanini products, and where and how they are deployed? A: We are represented in more than 73 countries around the world, including non-military. This year has seen sales in the United Kingdom, Malaysia, Brazil, Spain, Vietnam, Iraq and Libya to name but a few countries. As to how our equipment is deployed, it all depends on the role, but to reinforce what I have said about multi-functionality, within those countries, we have sold the same equipment to Defence, Civil Protection, the Fire Services, an Environmental Agency, a Military Medical Department and finally chemical weapons decommissioning under the auspices of the Organisation for the Prohibition of Chemical Weapons. That final item says a lot about confidence in our systems. Q: Do you provide your products as Commercial-off-the-shelf, or under government contract or both? Are there any recent large scale purchases, or contract awards you are at liberty to discuss? A: A bit of both. We can provide as Commercial-off-the-shelf, but we are also requirements-led by our customers and manufacture accordingly; that is, we cut and bend metal. For instance, we integrated one customer’s water tank into the floor of their containerised decontamination system. This enhanced platform safety and stability, while freeing up surface space. Regarding large contracts, this year has seen the largest volume going to the Middle East and South America with a number of significant orders in Europe, South East Asia, and Africa. Q: Briefly, what is it that is unique about your CBRN detox agents and systems? What is it that you feel that Cristanini does differently than your competition? A: As a snapshot, I would say there are three areas; all of them relate to simplicity in complex and dangerous circumstances. For a start, we have an environmentally friendly, non-corrosive , universal decontaminant that detoxifies chemical and biological agents and most toxic industrial chemicals, and also decontaminates and contains radiological particulate. It’s immediately available to use, so just like the fire services, it’s straight into action with no requirement for the mixing of decontaminants. Secondly, we have one multi-functional machine with its own built-in generator that does everything. Thirdly, a powder as opposed to a liquid decontaminant and our ‘one machine’ solution brings extraordinary savings in the logistic footprint, so much so that our complete large scale decontamination system ‘TDS 21’ is within the underslung payload of a CH47F. What is unique about Cristanini, is that we have developed a philosophy, just as Armed Forces develop doctrine. At the centre of our philosophy has been recognition of the need to adapt to the contemporary and future operating environments. Q: What kind of feedback have you received from unit commanders or from individual team operatives who have used your products? A: The feedback has been extremely positive, particularly from individual operators. Just like doing the ‘washing up’ at home, decontamination has a bit of an image problem, compared to CBRN recce, survey and so on; yet it is vitally important. For soldiers who have been used to ‘lances’, the eye-catching Sanijetgun immediately appeals to them. 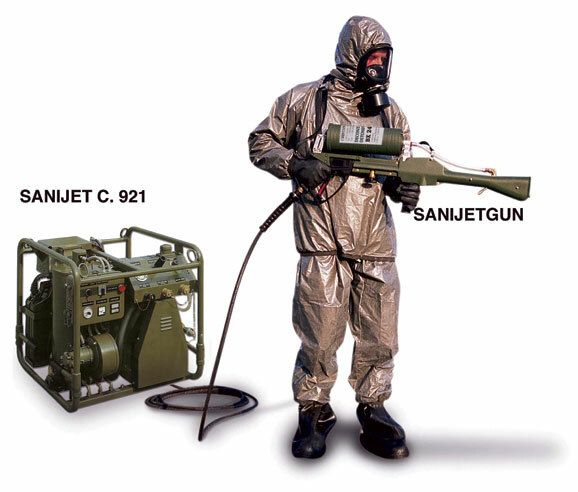 Just as they would adjust from safety catch on, to single shot to automatic fire on their personal weapon, on the Sanijetgun, they can adjust from low pressure, to high pressure to application of decontaminant. It looks the part and they are in control. The multi-functionality of the Sanijet System as a whole, in particular the trailer, always draws favourable comment. From the commanders’ time and resource perspective, we have enjoyed very positive feedback relating to its simplicity in training and on-site operations. One great piece of feedback concerned the use of our decontaminant BX24 when used by soldiers responding to the release of mustard agent from a 2nd World War chemical munition. In the words of the team’s Warrant Officer “It did exactly what it was supposed to do”. Q: Without revealing anything that may be proprietary, what is next for Cristanini in terms of detox agents and systems for Ground Troops and other Military Operatives? A: Research and Development has always been a significant priority and a strength within the company. Universities offer a fantastic source of knowledge and innovation, as does collaboration with international CBRN scientific centres of excellence. We are in the early stages of looking at further extending a ‘proof of principle’ that we already know to be highly effective, and in line with our philosophy of further easing the burden on the operator. I could not say more than that! We have already successfully expanded into other areas; solutions for sensitive equipment decontamination, mobile laboratories and this year unveiled our CBRN recce, survey and scene assessment vehicle, integrated onto a battle proven and ballistically protected platform.